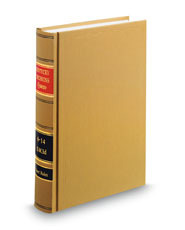 This product covers opinions and decisions issued by the state courts of Kentucky. Part of West's® National Reporter System, cases published in this product are enhanced with headnotes, Key Numbers, and synopses prepared by an internal staff of highly trained attorney editors. This set includes the cases published in Vol. 996, South Western Reporter®, 2d, and Vol. 1, South Western Reporter®, 3d from Kentucky, and omits cases from the other states covered by the regional reporter. It retains the pagination and citation style of the regional reporter.